Adobe Contribute CS4 allows Web site content contributors (writers, editors, artists, and other non-technical folk) to easily add to and edit Web sites, shielding them from the complexities of HTML and CSS. 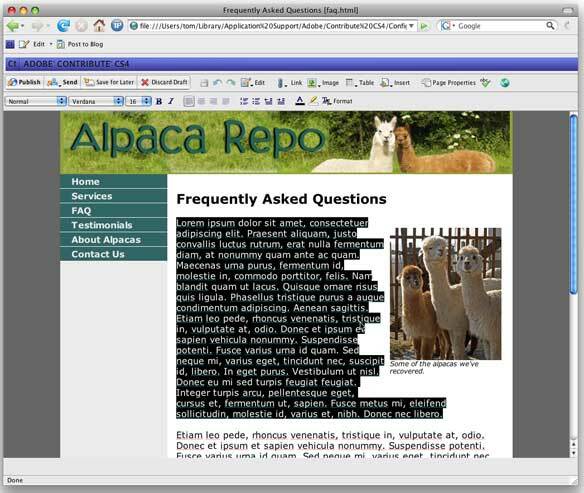 Users edit Web pages, usually but not necessarily based on templates prepared by a designer using Dreamweaver ( ), in an environment reminiscent of a word processor. It facilitates the editing of text and images without the danger of accidentally breaking the design or organization of the site. The new CS4 version provides a sprinkling of useful new features, but overall, this is a mediocre revision. Contribute is included in the Web editions of Adobe Creative Suite 4, and is also available as a standalone product. At first glance, this version looks like a big change from the previous version, Contribute CS3 ( ), but the change is really only skin-deep. The first thing that you’ll notice when you open the program is that the user interface has a new grayscale, panel-oriented look, similar in style to the other applications in the CS4 suite. There’s a new, largely useless Application bar right under the menu bar that runs the entire width of the screen. You can’t remove it, though you can resize it. One drawback to the new interface for Mac users is that Contribute CS4 really wants to take up your entire screen. Opening a document on my 20-inch monitor causes all background programs to be covered up by Contribute’s document window, toolbars, and panels. You can shrink the document window, but the toolbars and panels stick stubbornly to the top and left sides of your screen unless you manually move them elsewhere. In this way, the interface acts somewhat like a maximized Windows program, which isn’t expected behavior on the Mac, and sometimes gets in the way. Unlike previous versions, Contribute CS4 does achieve feature parity between the Mac and Windows versions. But Contribute’s performance does not seem to have improved in this version, which is a shame, since it has always been a bit slow to connect to and begin editing pages. Web page rendering fidelity has been improved, notably in displaying CSS (Adobe says that these improvements were made to match Dreamweaver’s similar rendering enhancements). Unfortunately, the program’s rendering is mostly unchanged, meaning that within the program, page display is still quite different than that of real Web browsers. Contribute’s developers should have followed the lead of the Dreamweaver team and implemented the cross-platform WebKit (used by Safari ( ), and in Dreamweaver CS4’s Live View), to achieve more accurate Web page rendering. You can set certain templates, created by Dreamweaver, to be the basis of a specified workflow, which helps organizations ensure proper approvals before pages are published. Contribute has long had the ability to assign different editing and publishing roles and privileges to selected users. For example, you can assign Writers to create and edit content, but not push it live to the site—that ability being reserved for the Publisher role. 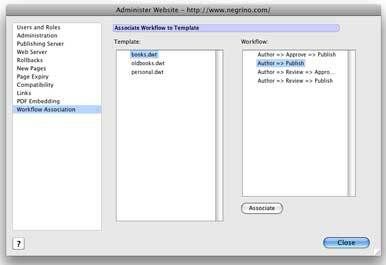 This workflow has been extended in the new version so that certain site templates can require a specific workflow. For example, a Web site could associate its Article template with a workflow that automatically goes from the author, to an editor for review and approval, and finally to a publisher who pushes the page to the live Web server. Four workflow paths come with the program. Though it may take some effort on the part of the site administrator to set up, this new feature will benefit large organizations by enforcing the necessary approvals before pages are visible to the world. After pages are published, you can set an automatic expiration date, so your content stays fresh. Pages don’t automatically disappear when they expire: Contribute alerts you beforehand. And, you can respond by doing nothing, in which case the page stays up until you remove it. Inline comments is another useful new feature for Web teams. When someone sends you a Web page for review, you can now select text and add your comments in a pop-up window, similar to adding comments in Acrobat ( ). Contribute has a new inline spell checker, so errors are flagged in real time. It uses a dictionary shared with the other CS4 programs, not the OS X system dictionary, so your personal words won’t be available unless you reenter them. And, in editing mode, draft pages are now automatically saved at a frequency you set. One of Contribute’s interesting and useful new features is a new toolbar for Firefox 2 ( ) (Adobe promises future Firefox 3 ( ) support) that provides the Contribute editing tools inside the browser, so that you can perform many editing tasks without leaving Firefox or needing to launch Contribute. This can actually be very useful, lowering the barrier to making quick changes to your sites. Unfortunately, there’s no similar toolbar for Safari, but in this case the fault lies with Apple for not providing an interface for third-party developers to add features to its browser. With the new Contribute toolbar, Firefox users can either open a page for editing in Contribute itself, or can edit pages with Contribute’s tools without leaving the browser, as shown here. Adobe appears to be competing with itself by introducing the hosted In Context Editing (ICE) service, which also allows inexperienced users–who don’t own Contribute–to edit Web pages in a browser such as Firefox, Safari, or Internet Explorer (with Flash Player 9 or later installed). Differences between the two products point to Adobe positioning Contribute more for use in corporations and higher education, and ICE for casual users. Contribute cannot edit pages on ICE-enabled sites, and ICE can only edit pages specially prepared in Dreamweaver CS4. This protects against accidental editing changes from different and unsupervised users. Adobe has increased Contribute CS4’s standalone price by $50, and the upgrade price by $20 over the CS3 pricing. However, most people will be getting the program as part of a CS4 suite upgrade, where it is essentially free with the rest of the package. For individual users of the standalone product, Contribute CS4 is not a worthy upgrade, due to the lack of compelling new features. Larger companies may benefit from the improved workflow options, and you need to update all of your copies of Contribute if you want to take advantage of the new collaborative features. But if you are pleased with Contribute CS3, you will probably not find the changes in this version to be worth the upgrade cost.